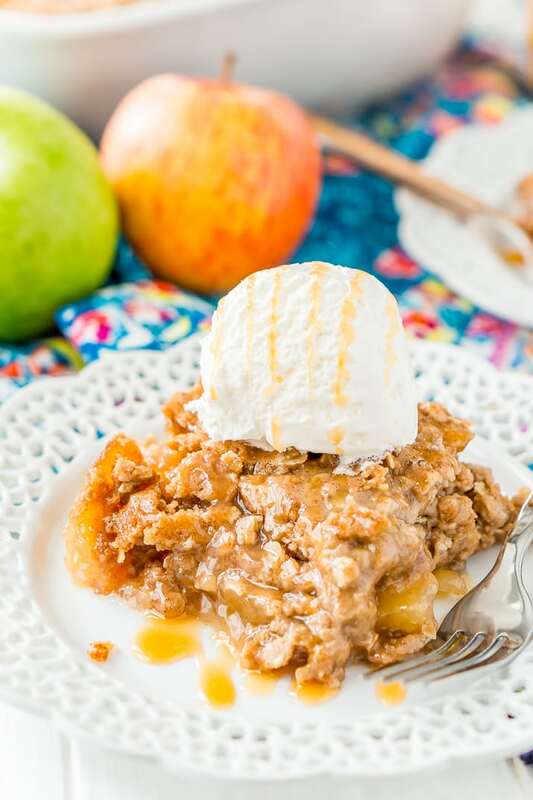 This Apple Dump Cake has to be one of the easiest apple desserts in existence, made with just four ingredients and a couple optional garnishes! It’s the perfect fall dessert to let the kids help make and so delicious that you’ll want to serve it up for Thanksgiving too! JUST TAKE ME TO THE APPLE DUMP CAKE RECIPE ALREADY! 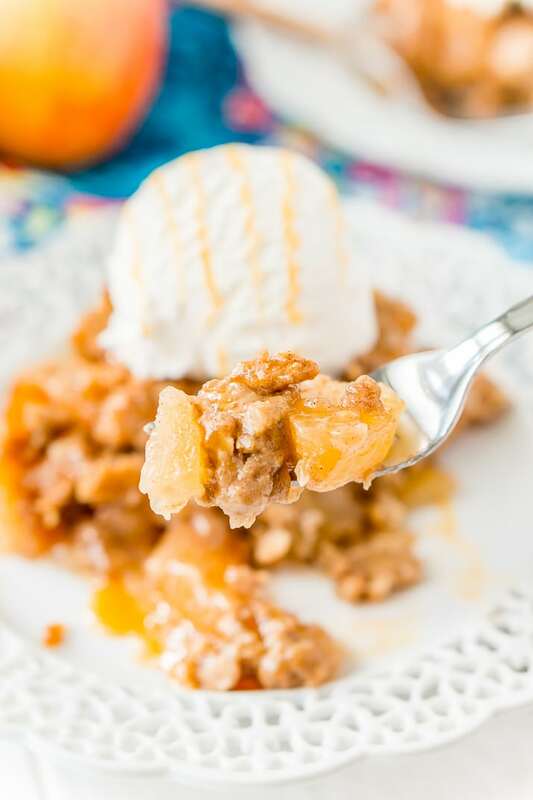 If you’d rather skip my (very helpful, I think) tips and tricks, essential cooking info, and similar recipe ideas – and get straight to this deliciously easy Best Ever APPLE DUMP CAKE Recipe – simply scroll to the bottom of the page where you can find the printable recipe card. I also like adding a sprinkle of cinnamon and sugar, and of course, a scoop of French vanilla ice cream or a dollop of Homemade Whipped Cream! Since you don’t need fresh apples for this recipe, you don’t have to worry about peeling or dicing any fruit. You can also use white or yellow cake mix instead of spice cake, but I love all that extra fall spice flavor! Dump Cakes are a really easy dessert usually consisting of just a few ingredients, generally cake mix, fruit, and butter. The idea is that the ingredients can just be dumped into the pan (get it?! ), stirred, and baked. 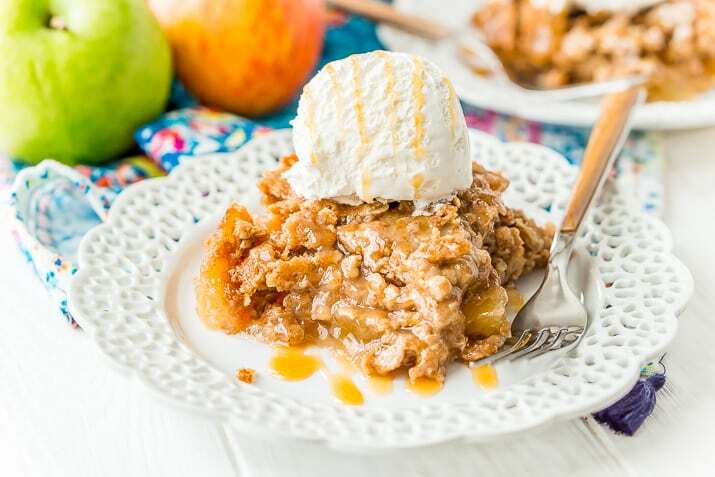 This Apple Dump Cake Recipe is made with two cans of apple pie filling, a box of spice cake mix, a cup of one-minute oatmeal, two cups of butter, and there are a few customizations you can add if you’d like! To prepare this dessert, you pretty much just dump the apple pie filling into a 9×13-inch baking dish. Next, you’ll whisk together the cake mix and oatmeal and sprinkle it over the top of the apple pie mixture. Finally, you’ll pour the melted butter evenly over the top of the cake mix then pop it into the oven, and well … that about covers it. 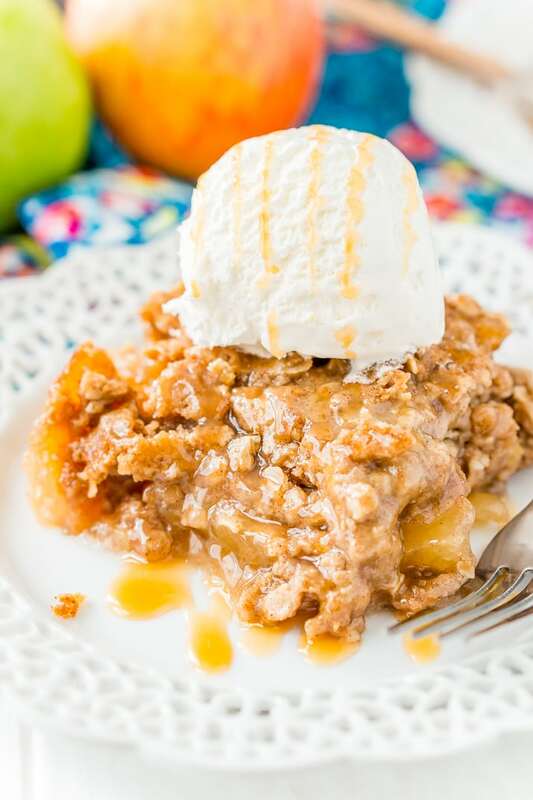 For Caramel Apple Dump Cake, you’ll need some caramel topping to drizzle on it before it’s served. You can also stir a 1/4 cup of caramel sauce into the apple pie mixture before adding it to the pan! Don’t have Spice Cake Mix? That’s okay, you can use white or yellow cake mix instead and add 1 teaspoon of Apple Pie Spice and 2 teaspoons of ground cinnamon to get a similar flavor. Not an Oatmeal fan? That’s fine too, you can just omit it from the recipe making this a 3-ingredient dessert! 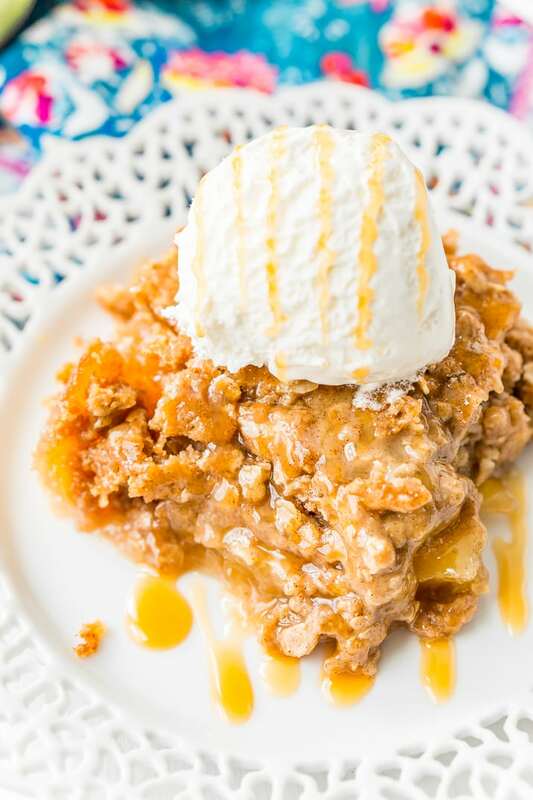 Apple Dump Cake is basically a cross between Apple Crisp and Apple Cake, but the recipe is even easier than either of these if you can believe it. It’s so simple, you can even throw one together on any weeknight to enjoy after a family meal. But no one has to know how little effort it takes to make it. Apple Dump Cake is ridiculously good, so it’s the perfect treat to bring to get-togethers. You might also enjoy my Pumpkin Crumble Cake! One of my favorite tricks is to whip up this dish before company comes over so the whole house smells like cinnamon-apple goodness. Pretty clever, right? Make this Apple Dump Cake once, and you’ll make it again and again! Festive, delicious, and ridiculously easy to make, this will become one of your family’s new favorite recipes! 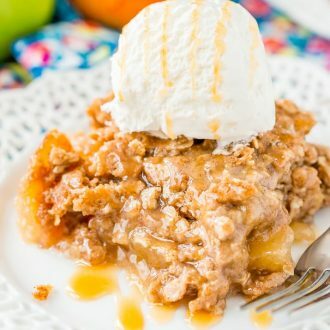 Pin this Apple Dump Cake Recipe for Later! 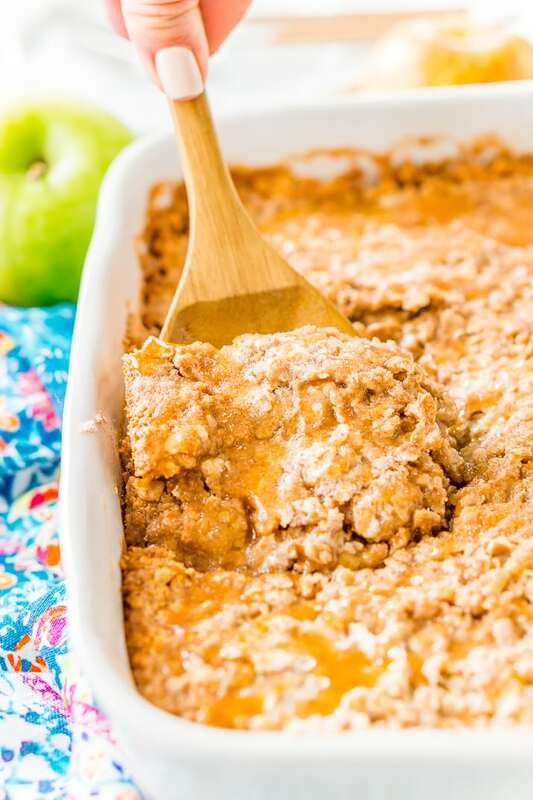 Apple Dump Cake is a 4-ingredient recipe that results in a delicious fall dessert somewhere between apple cake and apple crisp! Pour the apple pie filling into a 9x13-inch baking dish. In a medium bowl, combine the cake mix and oatmeal and then sprinkle it over the pie filling. Pour the melted butter over the top of the cake and oatmeal mixture as evenly as possible. Bake the cake for 40 to 50 minutes. The top of the cake should be slightly crisp and golden brown. Nutritional information is an estimate based on 15 servings and does not include caramel sauce, ice cream, or whipped cream. Unsalted butter may also be used and you can add salt as desired. This recipe looks delicious…love the simple ones…have a extremely busy schedule. Run an insurance agency, teach 18 piano students 3 nights a week and have 9 people living in our home. So recipes like this are wonderful!!! Thank you for sharing! Woah, you are a busy lady! I’m glad this recipe will make your fall gatherings a little easier! Enjoy! My family really enjoyed it, but the recipe calls for to much butter. I think one cup of butter would be better if you are looking for a more crispy crust. Hi Caroline, I’m glad you said something because there was actually a typo in the recipe. It should have been 2 sticks not 2 cups. 2 sticks is 1 cup so you are correct in that that’s how much butter this recipe needs. I’m glad you still enjoyed it and I apologize for the typo. Can this be served cooled or has to be right out of the oven? It can be served cool.